We lost some of our members to the fighting—some were killed in Malakal, others were killed in Juba. South Sudan has an area of 644,329 sq. km. (248,777 sq. miles). A July 2015 estimate places the country’s population at 12,042,910. 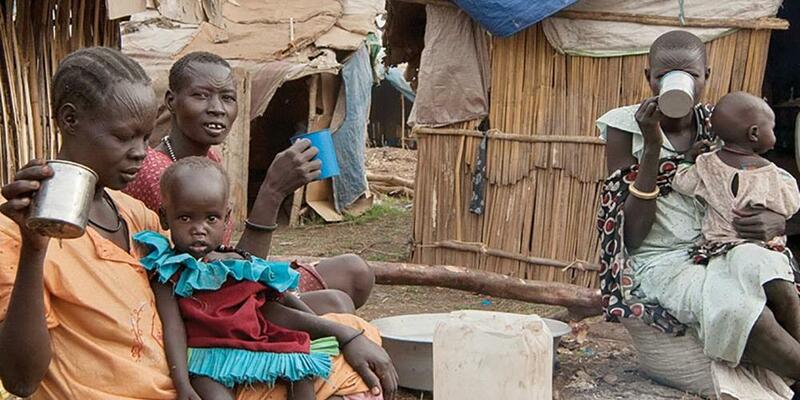 The median age in South Sudan is 17. Of the many ethnic groups in the country, the Dinka, at 35.8% form the largest group, followed by the Nuer at 15.6%. When we arrived at the U.N. compound we found that most of our Adventist members were there. They welcomed us and gave us a very small place to stay with some wood sticks holding up bed sheets tied to the top. We slept underneath this canopy at night. We registered in the camp, where we received our food ration card. When the World Food program people came, we showed them this card and received grain, oil, and salt to help us survive. The U.N. also gave some food, but not enough. Water was scarce, with our only supply being the Nile river. Each family was given one or two 20-liter buckets a day for all of their needs—drinking, cooking, and bathing. After living in the camp for two months, we were able to make contact with our South Sudan Attached Field office in Juba and I was able to speak with the president, Pastor Clement. Pastor Clement made accommodation for us through the U.N., and we flew on a U.N. plane to Juba. Now we’re living here in Juba, and operating our Greater Upper Nile Field (GUNF) office from this location for now. We lost some of our members to the fighting—some were killed in Malakal, others were killed in Juba. The remaining members are scattered—some in Ethiopia, others in Kenya, Ghana, Sudan, and in the refugee campus. We’ve only been able to make contact with those in Ethiopia, Sudan and in the camps. Some work for NGOs (non-governmental agencies), and they send back their tithe. Whatever little they get, they send in their tithe to keep our field surviving. The Greater Upper Nile Field is operated by General Conference appropriations through the East-Central Africa Division, and by the members’ tithe. At the end of 2014, the GUNF had a total of 7,369 members. We are praying that peace will come so that we can go back to Malakal. Our three Adventist schools in the area were also demolished. All were looted. All were destroyed. These are the challenges waiting for us when peace is restored. Our members are worshipping under trees, because there is no other place for them to worship. The South Sudanese government and the rebels have signed an agreement. We hope and pray that peace is going to come to our country. We believe that with God nothing is impossible. He will intervene and bring peace—hopefully soon. At least here in Juba there is a church where we can worship, but there is no place for the children to meet for Sabbath School, Adventurers, Pathfinders, and other youth activities, except for under the trees. Your Thirteenth Sabbath Offering will provide a “lamb shelter”—a simple but important building where the children can meet here in Juba. Thank you for your generous mission offerings—they truly make a tremendous difference, especially in the lives of our children who have been traumatized by the sound of guns and war for a long time.